In 1996, I went to the U.S. as a high school exchange student. It was there that I heard the words "email" and "Internet" for the very first time. Left: The Internet is becoming more and more popular in Azerbaijan, especially among today's youth. I was talking to one of my friends and complaining that it took more than a month for my letters to reach Azerbaijan. She asked: "Why don't you just send an email?" I didn't even know what email was at the time so she showed me how to do it and how to surf the Internet. Unfortunately, at that time, I didn't know anyone in Baku who had email or access to Internet. So I kept sending letters home by "snail mail", dreaming of the day it would be possible to take advantage of this technology in my country, too. Fewer than four years have passed and it's amazing how much things have changed. Now Azerbaijanis send emails all over the world, join Azerbaijani chat rooms and are busy creating their own Web pages. When I went back to the U.S. again not so long ago, this time I was able to communicate with my family and friends in Baku by email and even send photos of myself in Disneyland! 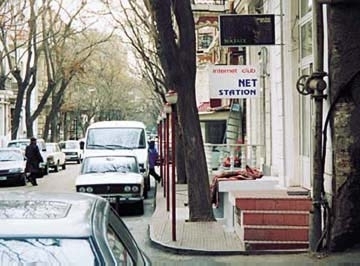 Left: Internet Club in Baku. Signs are usually in Russian or English. Almost all of my friends have personal email accounts and access to the Internet now. Recently, I met a student from Ganja [one of our ancient cities in northwestern Azerbaijan], who comes to Baku for correspondent classes twice a year. She asked for my email address. I was shocked. The Internet is becoming widespread even in other parts of our country. Quite a few of us have access to computers either at school, university or work. Computer courses are very popular these days, especially among young people, since many foreign companies require language and fundamental computer skills. There are several courses available, such as the ones offered by Soros that are free. After attending their training course (taught only in Russian), they provide a membership card so that you can access their Internet computers an hour each week. Another option is the U.S. Embassy Library, which has seven computers available to the public. Since they're reserved for research, you can't use them to chat or check email. Since only a few people can afford their own personal computer ($650 and up), many choose to log on at the Internet clubs and cafes that have sprung up all over Baku in the past six months. These clubs cost 7,000 to 8,000 manats per hour (a little less $2). Some clubs issue membership cards for $10 and charge their members only 4,000 manats ($1 per hour). Email accounts are free at Web sites such as yahoo.com and hotmail.com. Internet clubs are especially popular among teens and young adults such as 18-year-old Orkhan Azayev, who studies at Azerbaijan Technical University. He says he likes to visit Internet chat rooms and have conversations with other Azerbaijanis. "I usually chat at a site called Bakililar," says Orkhan. "I don't chat much with foreigners since my English isn't that good. But there are some Azeris who do chat with foreigners in English." Chat rooms are even available in Azeri. Some of the club computer keyboards have the Russian keyboard layout with Cyrillic, for those who want to visit Russian chat rooms. For the Azeri chats, there are American keyboards with Azeri Latin fonts. One of the Internet club directors told me that some young people go a little overboard in the chat rooms, spending as much as six or seven hours a day chatting. "These are just stages that we are passing through," the director told me. "Right now people are mostly interested in chatting and things like that, since it's so new to us. Later on, they'll do serious and useful work on the Internet. Besides, it isn't just Azerbaijanis who spend a lot of time chatting on the Internet - young people from other countries do it, too." Some Azerbaijanis use the Internet for research. Aslan Mehdioghlu, a 21-year-old student at Western University, visits a local Internet club several times a week. "We have free Internet service at the university but since there are so many students it's hard to get on the schedule. So I come to the Internet club." The Internet is providing us young people with access to the world. It came at a perfect time, enabling us to make up for all of the lost time of living in the Soviet Union and being cut off from the rest of the world. As more and more of us gain access to computers in our homes, no doubt the Internet will have a profound effect and totally revolutionize our lives.